The Kepler spacecraft houses a photometer that is pointed and records data from a single group of stars for the duration of a single mission. 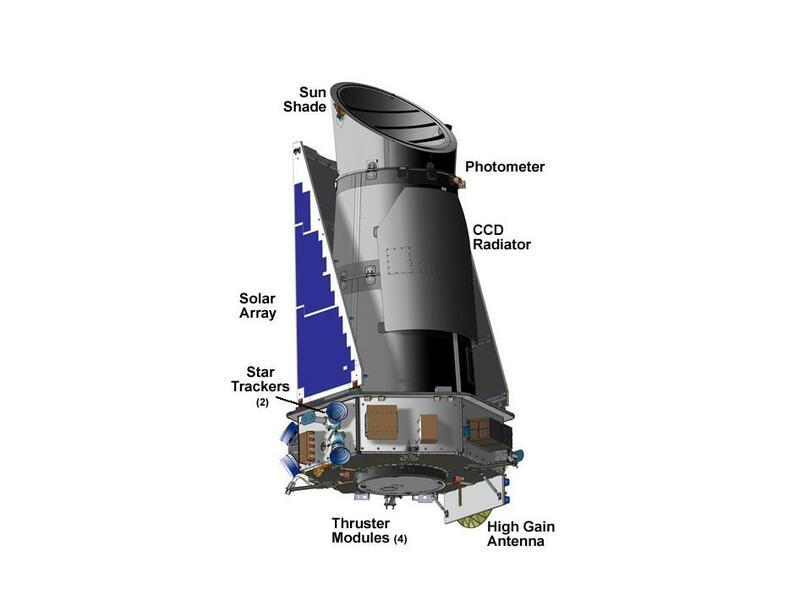 The Kepler Space Telescope was the spacecraft launched by NASA to discover exoplanets back in 2009. Its purpose was to monitor a particular region in space and collect data on the brightness of stars. It would send the data back to Earth for analysis. Astronomers would look for variations in a star’s brightness suggesting a planet was orbiting the star and blocking out some of the light. Data from Kepler led to the discovery of 962 confirmed exoplanets in 76 different solar systems. This includes the first Earth-sized exoplanet found in a star’s habitable zone, Kepler-186f. The Kepler program was shut down in 2013 when a second of four reaction wheels failed and could not be repaired. These reaction wheels are specialized flywheels used to orient the spacecraft and maintain its focus on one region of space as it orbits the sun. To orient in three directions, at least three functioning reaction wheels are required. The telescope part of the spacecraft still functions and it seemed a shame to not use it. NASA astronomers developed a plan where the spacecraft would continue its mission without a third flywheel. 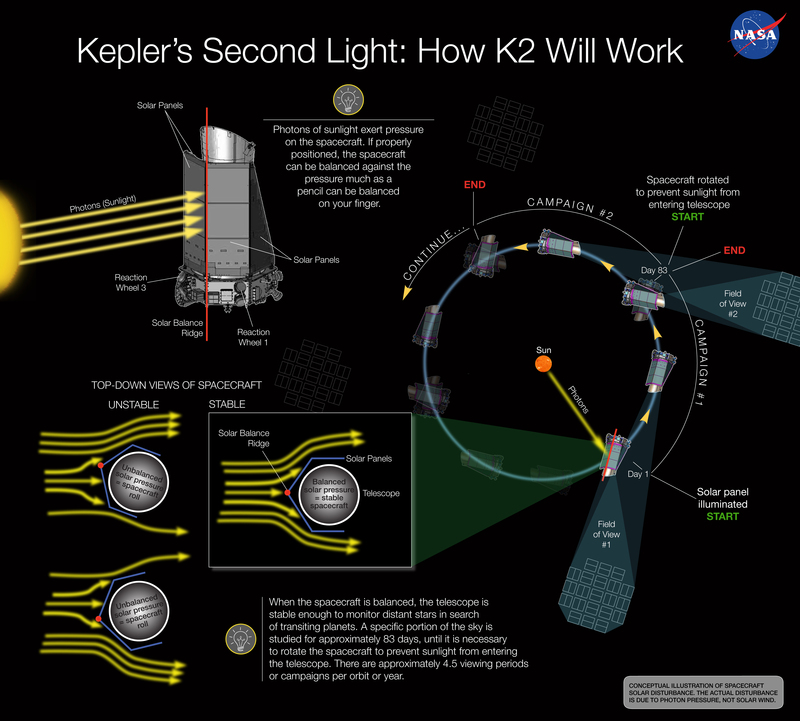 Kepler’s two remaining reaction wheels allow the spacecraft to be stable in two dimensions. Light pressure from the Sun striking the telescope causes the spacecraft to roll. The plan involves orienting the solar panels to balance the craft using that force. If they can maintain the pressure equally, the spacecraft could maintain the days-long focus it requires to collect data from one region of space. This plan, dubbed Second Light, or K2 has been approved and Kepler will be back in action in at the end of May 2014. Its mission will be broken up into two 83-day campaigns. The telescope will monitor a region of space along the ecliptic plane, or the plane where all the planets orbit around the sun until the Sun’s light would enter the telescope’s field of view. The spacecraft would then be rotated to monitor a different region of space for the next 83 days. This technique could be continued indefinitely as long as the telescope and the remaining two reaction wheels continues to function. Now that Kepler is returning out of retirement, perhaps it will find many more exoplanets. For further reading, visit NASA’s K2 mission concept website.